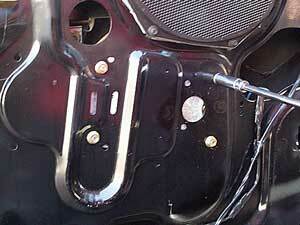 The studs on the body of the regulator are lined up with the 4 holes in the door. The nuts are fastened to the studs and tightened. The long channel is then lined up with the studs on the window. The glass may need to be moved either up or down in order to line it up. The nuts at the holding the short balance channel is tightened up in the same position it was taken off. There will be markings on the door (from the nuts) in the position where it was originally mounted. The nuts on the long channel are then tightened. If the window was moved in order to line up the channel, it may be necessary to electrically move the regulator in order to reach the remaining nut. Remember the nut that was removed through the hole next to the speaker? 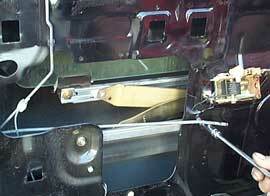 It is possible to move the window regulator by supplying 12 volts to the blue wire and ground to the black wire. If you need to move the widow in the opposite direction, simply reverse the wires. Supply 12 volts to the black wire and ground to the blue. 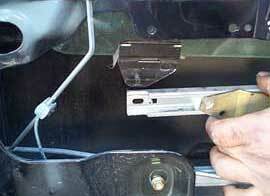 If you have a good memory, you can also wait until the switches are wired up to tighten this nut.